… but I ran out of compost. We got the top compost layer added to the center beds, topped up the gravel in the paths another inch or two to come partway up the rocks that line the pathways, to hopefully hold them in place a bit, then added about 4-6 inches of compost to the beds raised beds, 3-4 inches on the outsides. 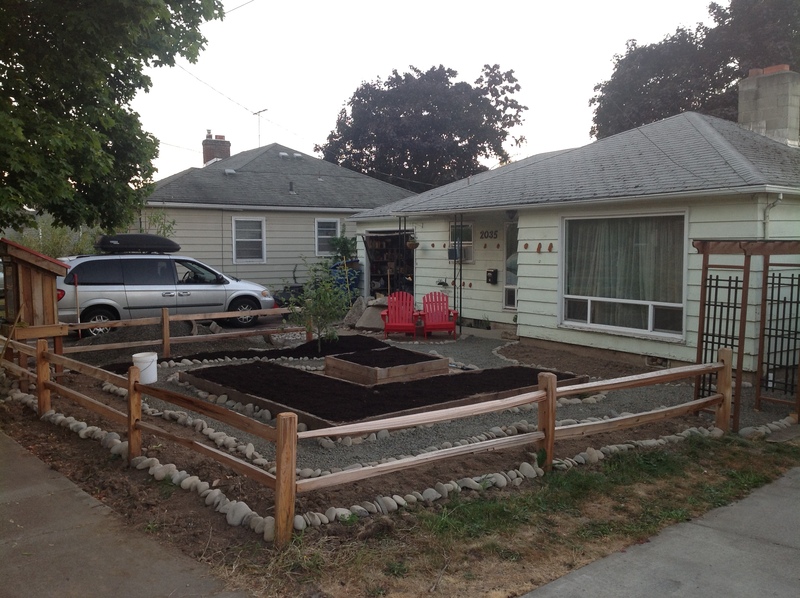 We made a large rock garden under the Little Free Library out front… We are close. In fact – once it’s all in – the final step is handing Shannon a wad of cash and sending her the nursery. … should I be scared? Shannon and I are avid readers. She is flat out voracious and tears through books – I go in spurts… when I’m inspired to read something, I’ll devour it, then there’s typically a bit more time between my books. I also tend to be very choosy in what I spend my time reading, so my volume tends to be a bit fewer and farther between. I have always viewed reading as extremely important. Realistically, reading is one of those things that no one can take away from you. They can take your property, they can lock you up, but they cannot prevent you from having the skills to educate yourself with the written word. One of my favorite quotes regarding the importance of reading is on a poster in my classroom, and I refer my students to it regularly. Mark Twain hit the nail right on the head. It doesn’t do you any good if you know HOW to read and choose NOT to… like some kind of purposeful illiteracy. 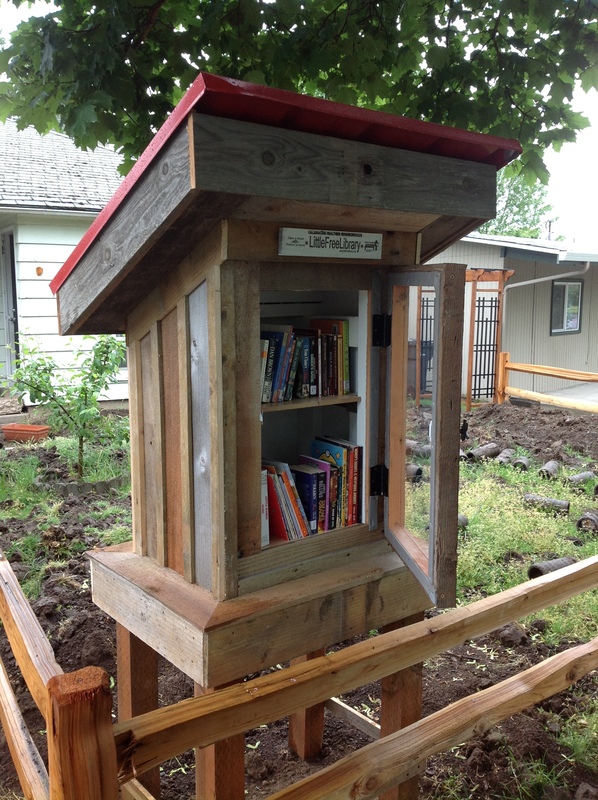 I recently came across a movement that is moving across the country; Little Free Libraries. The basic idea is to saturate neighborhoods with small libraries full of books that are free for the taking. Ideally people return them, but if they disappear entirely — it’s not the end of the world. This solves one of the big issues behind why people don’t read – book accessibility. I know… I know… there are libraries in nearly every town in the country… But the fact remains – if people have to go out of their way to get to the library to go find books — unless they’re REALLY motivated… it’s just easier not to go. The Little Free Library on the other hand, is always there… in some cases, it’s right next door. As people walk by, or ride by, or jog by – it’s a lot harder to resist stopping and looking through the titles that are there if it’s on your way home, or on your way to the bus stop, or on the way to the store. Because we get a lot foot traffic past the homestead, when I saw my friend Ryan building one for his place in West Salem, I decided that we HAD to have one. Shannon put up with MY crazy for once and agreed — and the building commenced. We had lots of leftover material from the chicken coop, so we built one modeled somewhat after the coop in back. Like the coop, it was built with recycled materials, the only material purchased was the Plexiglass in the door frame and the L metal that keeps the cut edges of the roof from the general public. We are the third LFL in the Salem area, and the only one in NE, the end of town I teach on. We’re super happy with it, and are pretty impressed that it’s been used so much already. I filled it up last night full of books. It was full when I left for work this morning and half of them were in people’s hands by the time I got home from work today… so the books are getting out into the hands of the neighborhood, but it remains to be seen if they will come home. Not the worst thing in the world if they don’t.